A few weeks ago, I found myself training an Autodesk Inventor course. As with any class, I always try to throw in a few of the "simple" tips. They're the little things, but things that can be used every day, in just about every Inventor session that lasts more than a few minutes. So as I thought about this post, I thought I'd collect a few of the common tips for different aspects of Inventor. And what better place to start, then at the beginning of nearly every Inventor part. Why not start with sketches? I won't get wordy on this one. It's time to just go ahead and jump right in. Here are five Inventor sketching tip. The order is random. It's not a ranking. It's just five tips that I like to use. 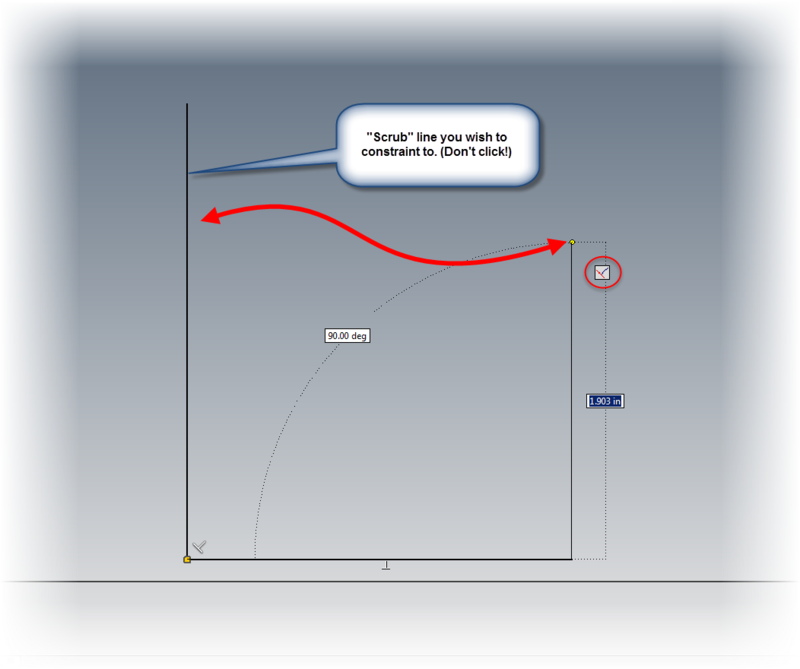 Inventor will try to add constraints as you sketch, such has horizontal, vertical, perpendicular, and parallel. But sometimes, those constraints aren't wanted. 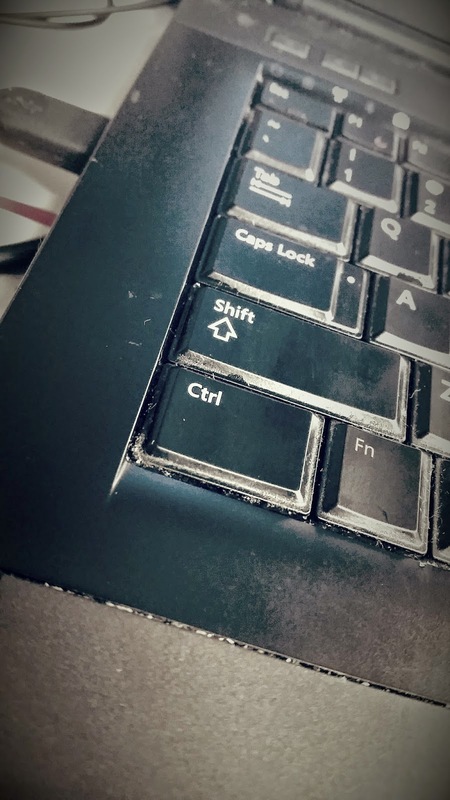 To turn off that functionality, hold down the Ctrl key. Automatic constraints are turned off as long as the Ctrl key is held down! That's my high mileage, very dirty Control key. When sketching, Inventor automatically creates constraints between the geometry being created, and existing geometry. At times this can seem to be arbitrary. But did you know that if you "scrub" the desired piece of geometry with your cursor, you can change what geometry Inventor is constraining to. Just remember to rub the geometry with the mouse cursor, don't click! 3. Creating an arc while still using the line tool. 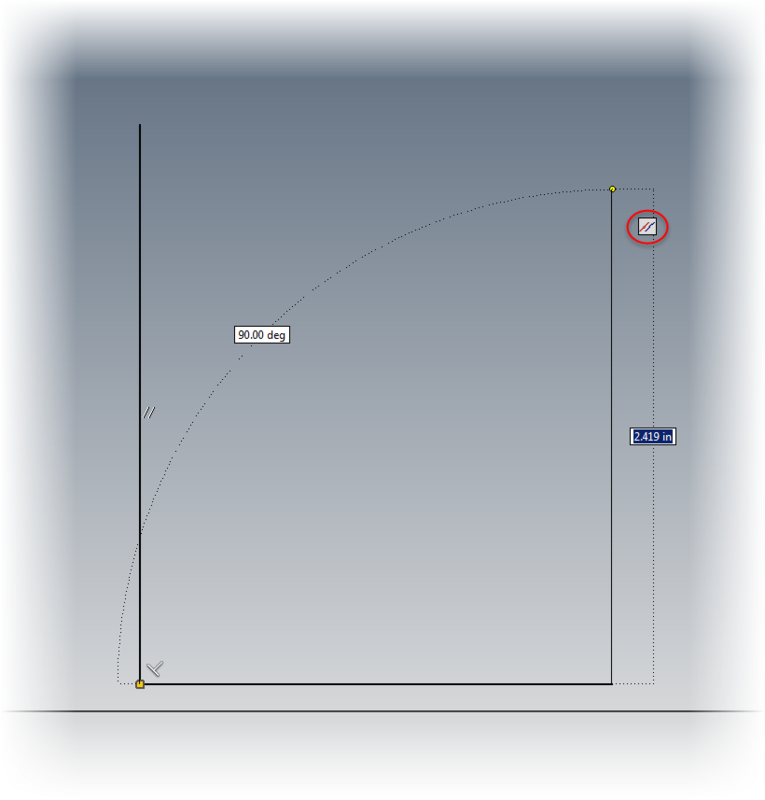 I compare this Inventor function as being similar to AutoCAD's polyline function, which is creating an arc while still using the line command. This tool takes a certain "feel" and a dash of patience, but I think it's worth it. 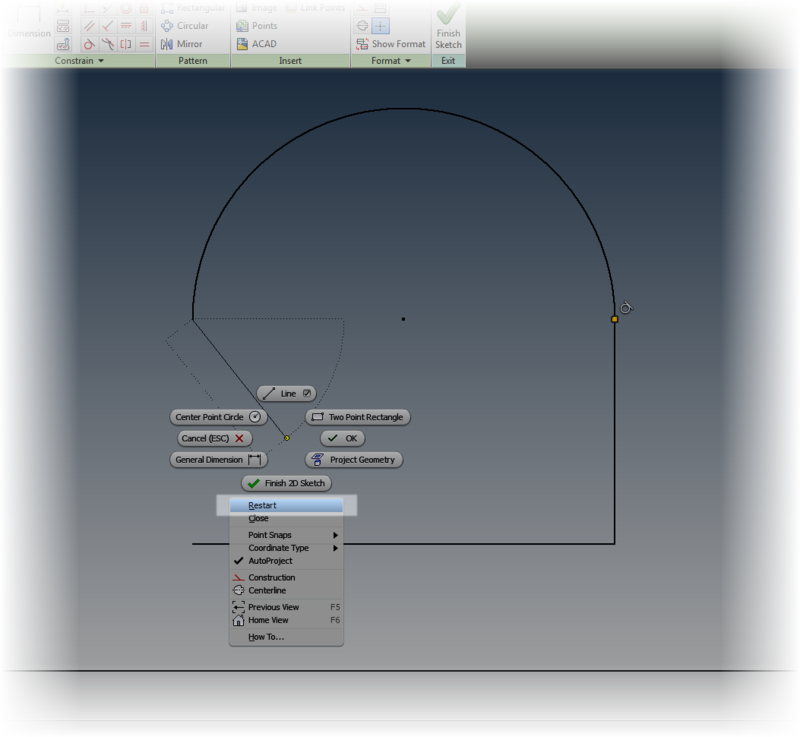 When still in the line tool, click on the end of the line where the starting point of the arc is desired. Now hold the mouse button down, and imagine your drawing the arc with your mouse cursor. An arc will appear! As long as the mouse button is held down, the arc can be changed. Dragging perpendicular to the line creates a perpendicular line, dragging in a tangent direction creates a tangent line. Lifting the mouse places the arc. Give it a try. It may take a bit to get used to, but it's worth it! 4. Closing a sketch with a right click. 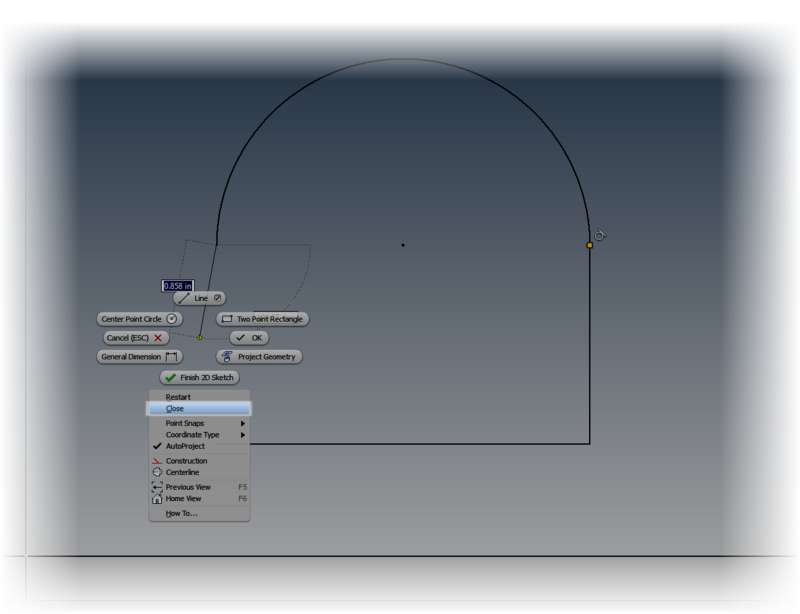 Another command that heralds back to AutoCAD's polyline functionality! When ready to close out a loop of sketch geometry, right click. In the right click menu, there's an option to Close. 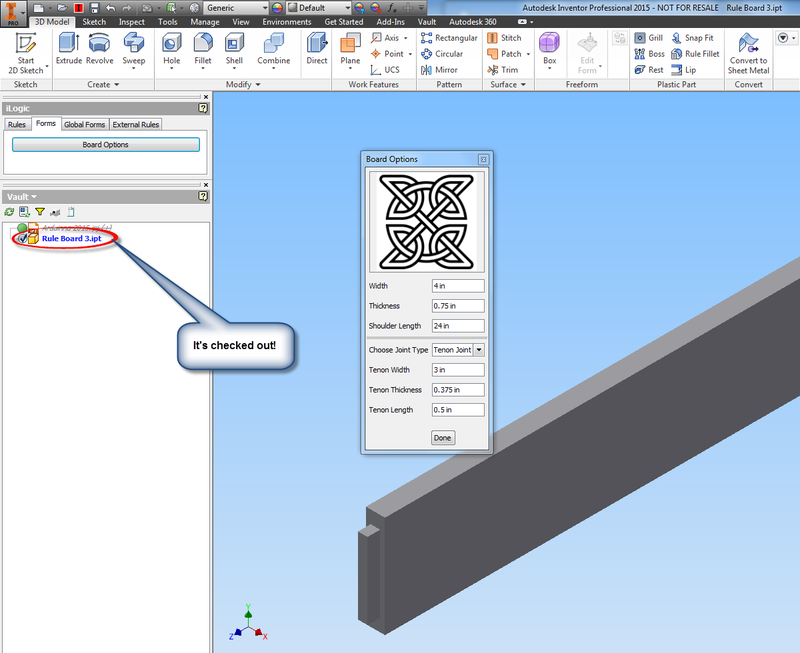 Save a few clicks by letting Inventor close the sketch! 5. Restart a line without restarting the command! There may be times when a continuous sketch may not be needed. But that doesn't mean that the line command has to be completely exited and started over. To create a line starting in a different location, right click, and choose Restart. The line can be started elsewhere without restarting the command! And to go with the tips above, here's a sketch tip to see those tips in action! Help! My Autodesk Vault Icons Are Having an Monochromatic Attack! I know I sound like a broken record, but still, I manage to remain busy, so creating videos has been forced to the back burner. I am hoping to change that soon! However, I'm still going to try keeping up with some simple tips. And here is another one for those of us using Vault. I ran into it just today. 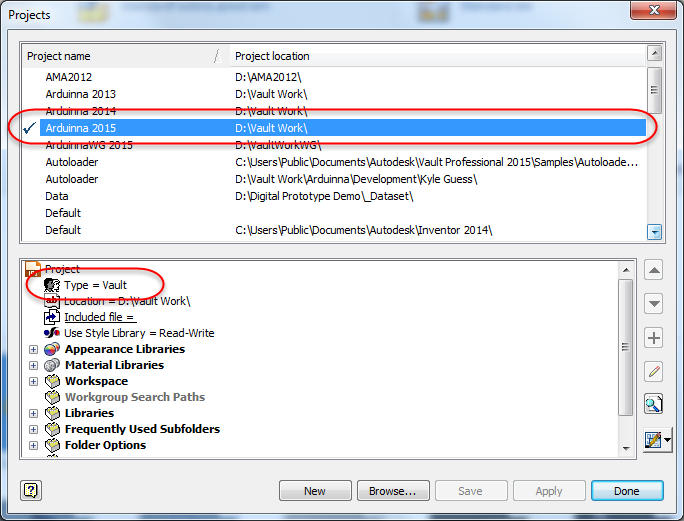 I fire up my trusty seat of Autodesk Inventor, and go to grab a file from Autodesk Vault using the "Open from Vault" option. And what do I see? Nearly all my icons are grayed out! I can log out, and log back in, but trying that doesn't do a thing! What causes this? Why would my Vault suddenly prevent me from getting to my files? The solution is often, fairly simple. Many times, and when I say many, I mean nearly every time, it's that the project in use isn't a Vault Project. First, close all files. Strictly speaking, this isn't necessary, but this will save you a step or two as we journey down this particular path. Once all files are closed, go to the Get Started tab inside of Inventor, and choose Projects. Time to pull the cover off. This step opens the project screen. Check the active project. This is the one with the check mark by it. Look in the lower pain, and see if it says "Vault" or "Single User". If it says "Single User", you've found your smoking gun. 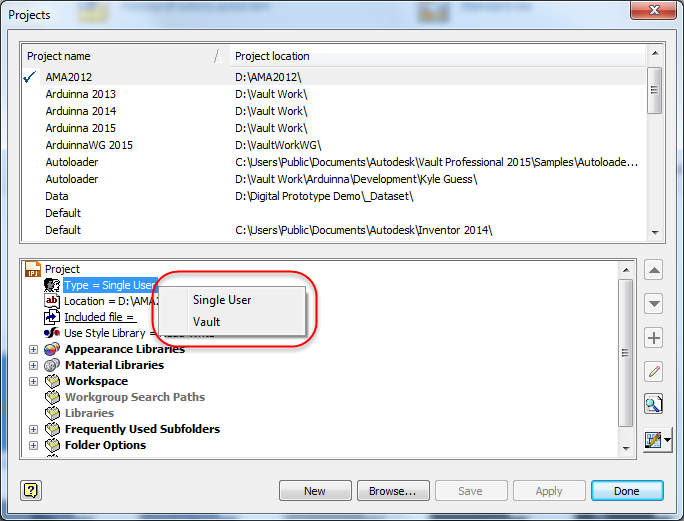 The project setting of "Single User" tells Inventor that Vault isn't being used by this project. As a result, Inventor turns off the Vault mapping and tools relating to Check In and Check Out while this project is active. Okay. Now that the problem is known, how is it fixed? There's two ways, and the solution depends on what's gone wrong. Fix 1: If this project is indeed the Vault project. Right click on the "Single User" setting and choose "Vault". If the project is checked into Vault, it's going to have to be checked out. Fix 2: This is probably the most common cause that I've seen. Make sure that the project hasn't been accidentally switched to a "Single User" project. For example, if you've recently migrated to a newer Inventor version, the project may be switched to "Default", which is by nature, a "Single User" project. If this is the case, double click on the correct project to activate it. If you don't see it in the Project Editor screen, you may have to browse to it in your Vault working folder. Believe it or not, that's it. It can really be that simple. But I have seen it happen more than a few times, and it's befuddled more than one user. So if you see that your Vault icons are acting in shades of gray, check the project first. It could be as simple as one little selection! A Little Poll. 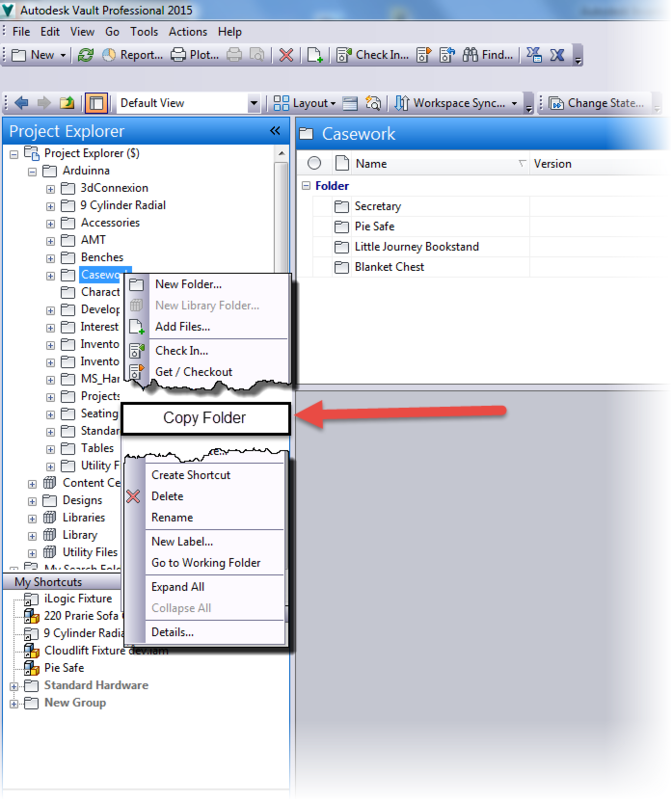 Copy Folders in Autodesk Vault? Would you like that? It's been another busy weekend! So I'm afraid I'm still playing a bit of catch up! What is it? 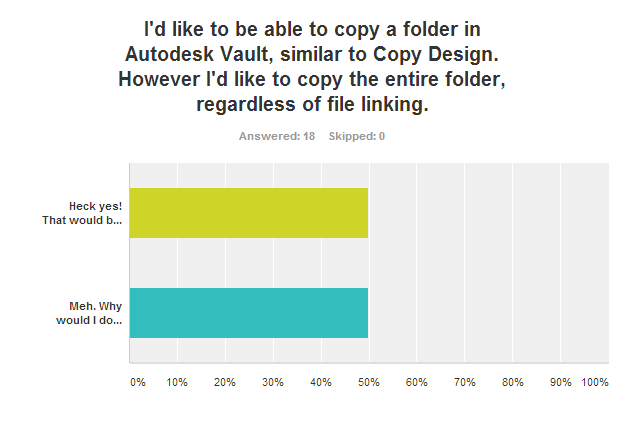 Is there a need for a "Copy Folder" function in Autodesk Vault? In other words, if I have a folder of files that aren't linked to each other via linking or assemblies, (so Copy Design won't grab them all, would a one click copy be helpful? Would a Copy Folder command be nice? In my personal use, it's a "meh" question. I've never had the need. But perhaps someone else has? Answer the survey below! What are your thoughts? I'll keep this survey open until Wednesday, 20-Aug-2014! The results are in. The responses weren't huge. Only 18 responses. But thank you to those who took the few minutes! And what was the conclusion? A 50/50 split. Right down the middle! It looks like for some, it's quite important, for others, not at all. Curiously enough, during this time, the folks at Cadline Community created a blog post on what *could* be new features in Autodesk Vault 2015 R2. Check that post out here. Specifically, look at the Copy Design enhancements, one of which is Copy Multiple Data Sets. 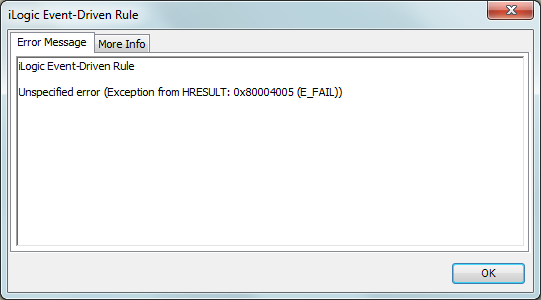 In short, iLogic in my version of Autodesk Inventor was broken. Rules that had created in my templates worked flawlessly before, were failing. I would just get error message after message. It puzzled me to no end. I searched and searched, and even tried a repair install to see if I could figure out why none of my iLogic rules weren't working. It was a frustrating couple of hours trying to figure out why my rules were broken. Finally, I threw up my hands and decided to ask Twitterverse if they had seen this error before. And luckily, Twitterverse answered in the form of Clint at Cadline, and Paul at CADSetterOut.com. Both from London, in the UK. Paul suggested permissions and sent some links to help. Clint asked if the rules were internal or external. Perhaps a folder was set to read only? I banged away at my keyboard. Thoughts of "Percussive Maintenance" flowed through my brain. Clint is kind enough to ask me to send him a file for him to check out. Grateful for the help, I send it to him . He responds quickly. The files work fine for him. My heart sinks as I realize it might be my installation. Something deep. Something insidious. Something sinister may be devouring my iLogic rules. But just when I'm about to give up for good and surrender that my iLogic rules may never be seen again, there's a faint glimmer of hope. A single sliver of silver light pierces the darkness clouding my mind. Clint's and Paul's suggestions form into a solution. That idea is just like Gandalf showing up at the end of every battle in Middle Earth to save the day when all is lost. (Gandalf has great timing, BTW). Then, the AHA! moment arrives. 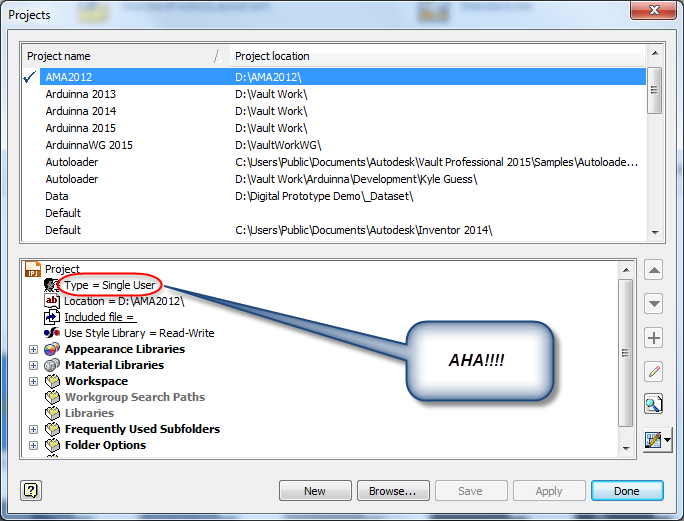 When I migrated to Inventor 2015, I had decided to story my template files in Autodesk Vault. The files, sitting in my template directory, were still checked into Vault. The files were read only! It was permissions! THAT WAS IT! I quickly checked out my files from Vault, and sure enough. My files began working again, just like advertised. So after all that, what's the moral of the story? The biggest one, is apparently, files with iLogic rules, whether internal or external, cannot be read only in any way. The rules I had my templates were all internal, but with Vault locking them down, it gave me a cryptic error. The second? Brainstorming can be a huge help. Without the input of Clint and Paul, I would probably still be struggling with this. It was because of their help that I was able to look at the clues in front of me that and realize the core of the issue. Thanks, gents. I couldn't have done it without you!